iPhone X. You've never seen anything like it. It's never seen anything like you. Get a brilliant new iPhone on us. Ends 3/31/19. Each req's min. $750 on installment. Req's new line. iPhone XR 64GB free after credits over 30 months. Credits start w/in 3 bills. If svc cancelled, device balance due. $30 Activation, add'l fees, taxes & restr's apply. IPHONE BOGO OFFER: Ends 3/31/19. Available in select areas & locations. Requires buying two eligible iPhones with one new wireless line. 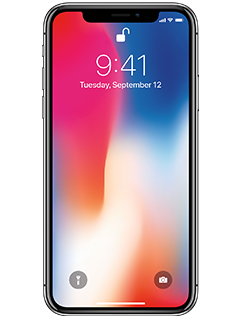 Eligible iPhones: iPhone 8, 8 Plus, XR, X, Xs, or Xs Max (priced up to $1449.99) on 0% APR AT&T Next (30 mos. up to $48.34/mo.) or AT&T Next Every Year (24 mos. up to $60.42/mo.) installment agreement. Tax on full retail price of both due at sale. After up to $750 in credits, get iPhone 8, iPhone 8 Plus 64GB or iPhone XR 64GB for free. Get iPhone 8 Plus 256GB, XR 128GB/512GB, X, Xs, or Xs Max for up to $750 off. Discounted device will be the lowest priced device. Req'd Wireless: Postpaid wireless voice & data on both devices (min. $80/mo. combined if new with autopay and paperless bill discount. Pay $100/mo. until discount starts w/in 2 bills. Existing customers can add to current plans). If you cancel wireless on one, will owe that device balance of up to $1,450. Activation/Upgrade Fee: $30/each. Return: Return w/in 14 days. Restocking fee up to $45 each may apply. Add'l BOGO terms for customers w/consumer acct & Subscriber Paid User acct: Buy one device must be on Subscriber Paid User acct & free/discounted device must be on the consumer acct. Billing addresses for Subscriber Paid User & consumer accts must match. Req's elig. postpaid wireless voice & data svc on both devices. Combined min. elig wireless svc is $28.50/mo. on Subscriber Paid User acct + $45/mo. on consumer acct after autopay & paperless bill discount. Pay $83.50/mo. until consumer acct discount starts w/in 2 bills.) Bill Credits: Credits start w/in 3 bills. Will receive catch-up credits once credits start. Applied monthly in equal amounts over entire agmt term & will not exceed the lower of the device cost or $750. Both wireless lines must be on same acct, be on an installment agreement, active & in good standing for 30 days to qualify. Installment agmts start when device is shipped. To get all credits, free/discounted device must remain on agmt for entire term and you must keep eligible service on both devices for entire installment term of free/discounted device. If you cancel service on either line, credits will stop. If you upgrade or pay up/off agmt on free/discounted device early your credits may cease. Limits: See your sales rep before any purchases to determine if eligible. May not be combinable w/other offers, discounts or credits. Purchase, financing, other limits & restr's apply. This offer may make your account ineligible for select other offers (including bill credit offers) for 12 months. GEN. WIRELESS SVC: Subj. to Wireless Customer Agmt (att.com/wca). Credit approval required. Svcs not for resale. Deposit/Down payment: May apply. Limits: Purch. & line limits apply. Prices may vary by location. Taxes, fees, monthly, other charges, usage, speed, coverage & other restr's apply per line. See att.com/additionalcharges for details on fees & charges. International and domestic off-net data may be at 2G speeds. AT&T service is subject to AT&T network management policies. See att.com/broadbandinfo for details. Pricing, promotions, programming, terms & restr's subject to change & may be modified or terminated at any time without notice.